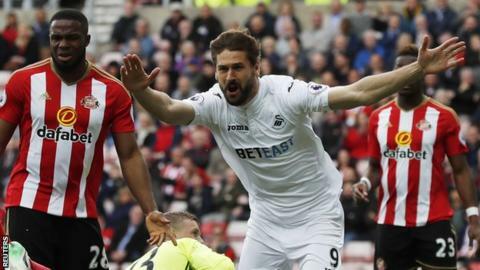 Swansea's Premier League safety could be confirmed on Sunday after goals from Fernando Llorente and Kyle Naughton gave them a deserved win over relegated Sunderland. An afternoon that had the potential to be a nervous one for the Swans became very comfortable once Llorente headed home Gylfi Sigurdsson's free-kick in the ninth minute. Naughton struck a decisive blow in first-half stoppage time with his first Swans goal - a superb angled drive into the far top corner. Victory opened a four-point gap between the Welsh side and 18th-placed Hull, who will be relegated to the Championship if they lose at Crystal Palace on Sunday. Sunderland, who beat Hull last weekend, were booed off at both half-time and the final whistle of an inept display that epitomised their season. As Swansea manager Paul Clement pointed out this week, it seems perverse for a side to celebrate narrowly avoiding relegation. However, having had three managers in the space of a season in which they were bottom at halfway with only 12 points, it was understandable why the Swans so enjoyed taking a huge stride towards safety. And celebrate they did at the final whistle of a completely one-sided encounter they never looked like losing from the moment the familiar link-up between Sigurdsson and Llorente put them in front. Sigurdsson now has 13 assists for the season, while Llorente has 14 goals and has scored in each of the three victories Swansea have recorded during a timely unbeaten run of four matches. Also timely was full-back Naughton's first goal for the Swans in more than 60 appearances. His angled drive - set up by a neat pass from former Black Cats loan player Ki Sung-yueng - ensured there would be no late nerves. It is now up to Hull to respond, otherwise Clement can lead his side into their final fixture at home to West Brom safe in the knowledge he will have a summer to prepare the Swans for a sixth successive top-flight campaign. Sunderland's defeat by Bournemouth two weeks ago confirmed the end of their 10-season stay in the Premier League. But two vastly contrasting displays since mean the Black Cats have provided a potentially decisive parting shot in the battle to avoid joining them in the Championship. At the KCOM Stadium last weekend, they showed enough in a 2-0 victory to give some hope that, with some strategic planning and rebuilding, they could bounce straight back to the top flight. But Saturday's heartless display, played out in front of a half-empty stadium that was almost devoid of home fans by full-time, laid bare just how much work they have to do. Any promotion effort next season looks unlikely to feature striker Jermain Defoe, who has scored 15 times this campaign but has a relegation release clause in his contract and appeared to be saying goodbye during a solo lap of the ground at full-time. Manager David Moyes has suggested he will continue in his role, but the home fans aimed negative chants in his direction during this game. The Black Cats end their home campaign having earned just 14 points - the fewest in the division - and with a run of 10 games without victory, seven of which they failed to score in. Sunderland boss David Moyes, speaking to BBC Sport: "Everyone watching can see we need big changes. We need to alter the playing staff and I think everyone is aware of that. "Jordan Pickford has been fantastic for us but he should never have got involved in the free-kick and we found it hard chasing the game. "We lost two players through injury which didn't help. We changed it at half-time but ultimately we needed to impose ourselves on Swansea. The first goal was the turning point." Swansea boss Paul Clement, speaking to BBC Sport: "It's a huge result for us. We've got ourselves into a strong position but the season is not over and we don't think it is done. Now have to look to next week. "There's still one game to go. We'll be looking at the Crystal Palace-Hull game with a lot of interest but we can be happy with our work today. "It was a bit of a messy second half but we got the job done." On Kyle Naughton's goal: "A lot of those go in our car park at the training ground. That goal was a great moment." Swansea ended a run of seven away Premier League games without a win to clinch their first victory since a 3-2 triumph at Anfield in January (D1 L6). The Black Cats have failed to score in 19 Premier League games this season, more than any other side - they last failed to score in more in a league season in 2002-03 (20 games). Eight of Sigurdsson's 13 assists in the Premier League this season have come from set plays, three more than any other player. Llorente has scored seven headed Premier League goals this season, more than any other player. Sigurdsson has assisted six of Llorente's 14 Premier League goals this season - the most from one player to another. Sunderland have two games to go before they relinquish their Premier League status. They may well wish they did not as they travel to Arsenal on Tuesday (19:45 BST) before a final-day game at champions Chelsea (15:00 BST). Swansea's immediate focus will be on Hull's game at Palace on Sunday (12:00 BST). The Swans' final game is at home to West Brom (15:00 BST). Match ends, Sunderland 0, Swansea City 2. Second Half ends, Sunderland 0, Swansea City 2. Attempt saved. Wahbi Khazri (Sunderland) right footed shot from the left side of the box is saved in the centre of the goal. Assisted by Sebastian Larsson. Substitution, Swansea City. Luciano Narsingh replaces Fernando Llorente. Martin Olsson (Swansea City) wins a free kick in the defensive half. Darron Gibson (Sunderland) is shown the yellow card for a bad foul. Foul by Darron Gibson (Sunderland). Corner, Sunderland. Conceded by Martin Olsson. Corner, Sunderland. Conceded by Federico Fernández. Attempt blocked. Jermain Defoe (Sunderland) right footed shot from the left side of the box is blocked. Attempt saved. Wahbi Khazri (Sunderland) right footed shot from the left side of the box is saved in the centre of the goal. Assisted by Fabio Borini. Wahbi Khazri (Sunderland) is shown the yellow card for a bad foul. Offside, Sunderland. Sebastian Larsson tries a through ball, but Jermain Defoe is caught offside. Corner, Sunderland. Conceded by Alfie Mawson. Jordan Ayew (Swansea City) wins a free kick in the defensive half. Hand ball by Jordan Ayew (Swansea City). Attempt missed. Billy Jones (Sunderland) right footed shot from the right side of the six yard box is close, but misses to the right following a set piece situation. Attempt saved. Wahbi Khazri (Sunderland) right footed shot from outside the box is saved in the bottom right corner. Substitution, Swansea City. Leroy Fer replaces Ki Sung-yueng. Offside, Sunderland. Darron Gibson tries a through ball, but Didier Ndong is caught offside. Attempt missed. Wahbi Khazri (Sunderland) right footed shot from outside the box is close, but misses to the left. Assisted by Sebastian Larsson with a cross following a corner. Attempt blocked. Fabio Borini (Sunderland) right footed shot from a difficult angle on the right is blocked. Assisted by Billy Jones. Corner, Swansea City. Conceded by Javier Manquillo.